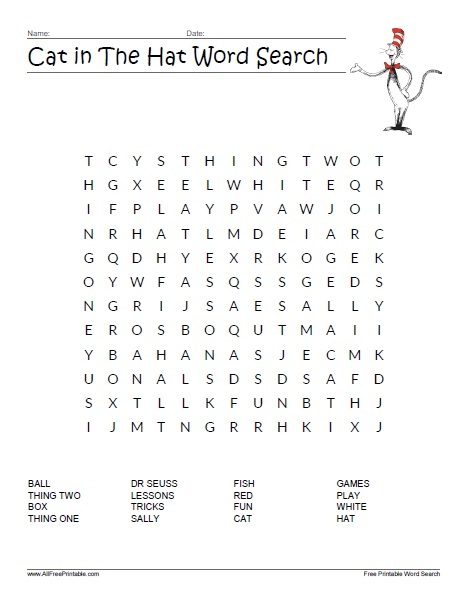 Free Printable The Cat in the Hat Word Search. Free Printable Word Search from the Dr. Seuss “The Cat in the Hat”. If you kids loves the Cat in the Hat they are going to love this fun word search puzzle. Share it with your kids, friends, students and everyone that loves Dr. Seuss books, movies, TV series. Print it free and search all words related to Cat in the Hat. Find words like Red, Sally, Thing One, Fish, Cat, Lessons, Ball, Thing Two, White, Hat, Play, Games and many more. The word search includes 16 easy to solve words. Cat in the Hat Word Search Puzzle is ready to print in PDF format.